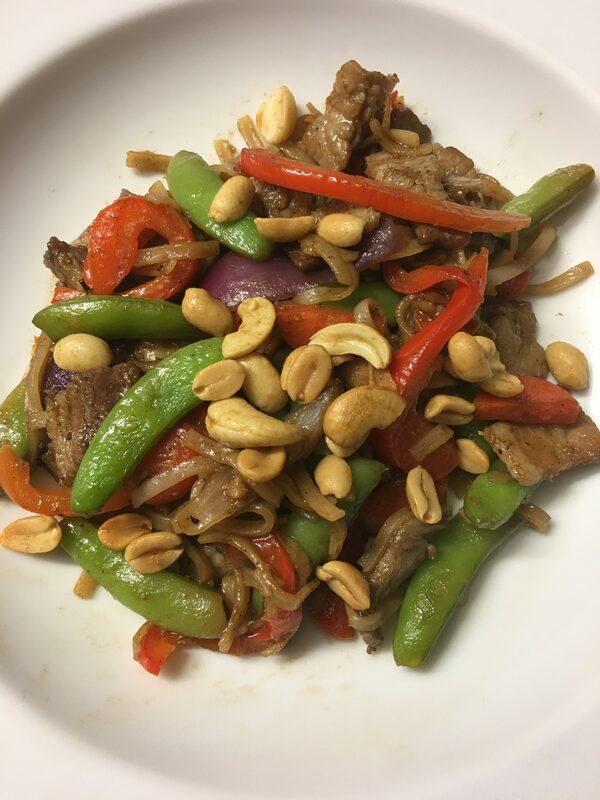 Try this delicious mid-week stir fry. Easy peasy and adaptable. I forgot to put the chilli on top for the photo. Leave it out for kids or anyone who doesn’t like things spicy. 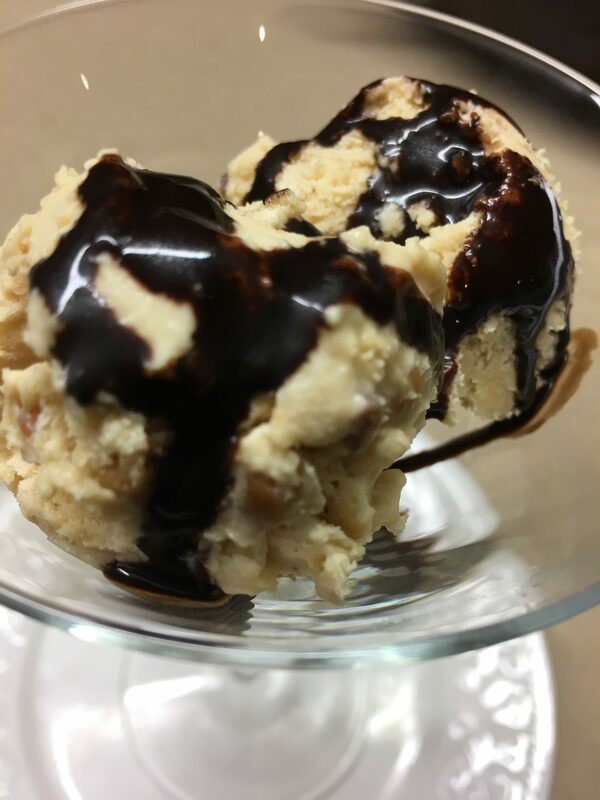 I’ve made this once a week for the past month and each time varied the recipe a bit. It’s always good. If preferred, leave out the noodles and serve with steamed rice. Combine pork, sugar, soy sauce, five spice and fish sauce in a bowl. Cook noodles according to packet instructions and drain well. Heat 1 Tbs oil in a wok or large frying pan and stir-fry the pork over high heat in two batches for 1-2 minutes. Transfer to a bowl. Add remaining 1 Tbs oil to the wok and over high heat stir-fry the onion, ginger, garlic, capsicum and carrot for 5 minutes. Add pork, snow peas, stock, oyster sauce and stir fry for 2-3 minutes. Mix in the noodles and a dash of water if it’s a bit dry. Serve garnished with the nuts and the chilli. Portuguese tarts are famous around the world. Creamy custard filling, encased in flaky pastry then cooked in a hot oven until they start to blister on top. They’re best eaten freshly made, but if there are any left over pop them into a moderate oven for a few minutes to crisp up the pastry again. In a large saucepan use a balloon whisk to combine all ingredients except the pastry. Bring mixture to the boil, whisking all the time, until thickened. Cover with plastic wrap and refrigerate until chilled. Pre-heat oven to 200°C. Grease 12 x 1/3 cup muffin pans. Roll out pastry and cut circles to fit the pans. Divide filling between the pastry cases – I managed to get 11 rather than 12. Bake for 20 minutes or until custard starts to brown. 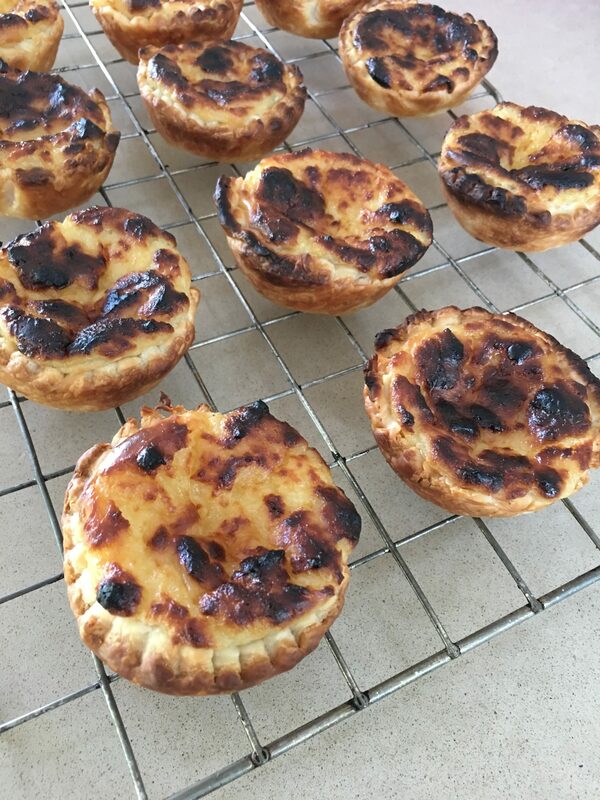 If you are able to switch your oven from Bake to Grill, or even better Fan Grill, for the last few minutes it will be easier to brown the tops of the tarts the way they do in Portugal, so they are a bit blackened. 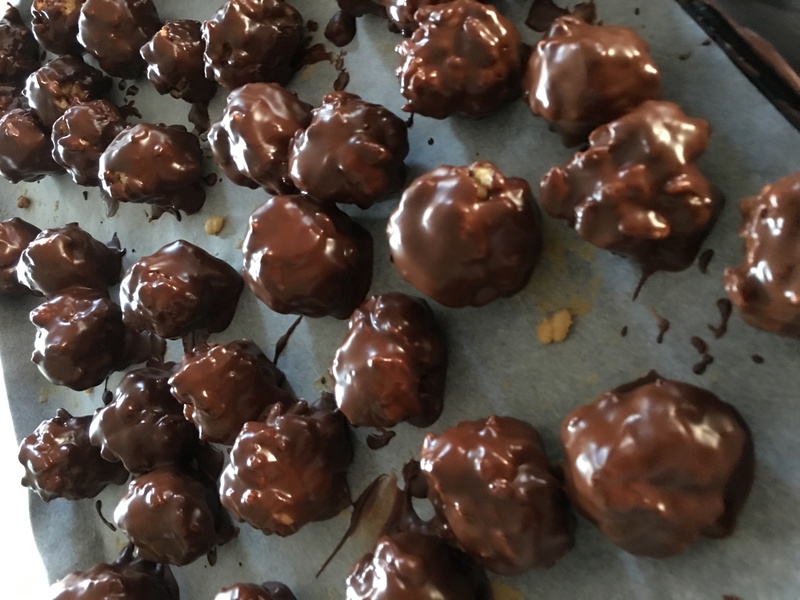 This popular Australian and New Zealand dessert was in the repertoire of all grannies and mothers in law when I got married and moved to Canberra from the UK in the 1970s. As it bakes, the pudding separates, leaving a light sponge on top and a delicious lemon sauce underneath. Many Canberrans have a lemon tree in their garden making this an ideal winter dessert. Preheat oven to 180°C. Separate eggs and place yolks in the food processor with ¾ cup of the sugar and the remaining ingredients. Mix until combined, stopping halfway to scrape down the sides. Place the whites in a bowl and whip with electric beaters until soft peaks form. Add remaining ¼ cup sugar and continue beating until you have a shiny meringue. Scrape the mixture from the food processor into the meringue and fold it all together, gently but thoroughly, with a spatular. Tip mixture into a buttered pie dish or individual ramekins, place in a roasting pan or large dish and add boiling water to come halfway up the pudding dish. Bake for 35 minutes, or until just set and golden. Individual puddings will take less time than one big dish. Don’t overcook or the lemon sauce will be absorbed into the topping and disappear. 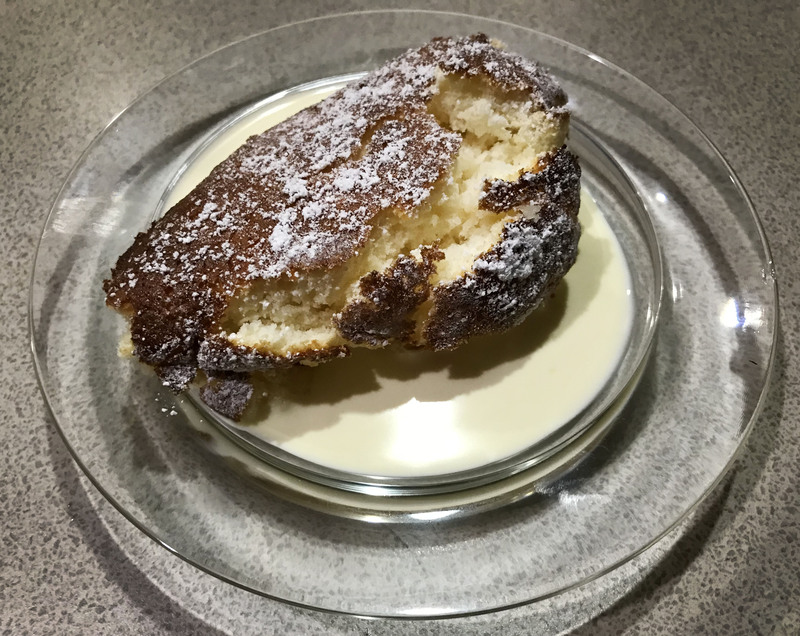 Dust with icing sugar and serve warm with cream. 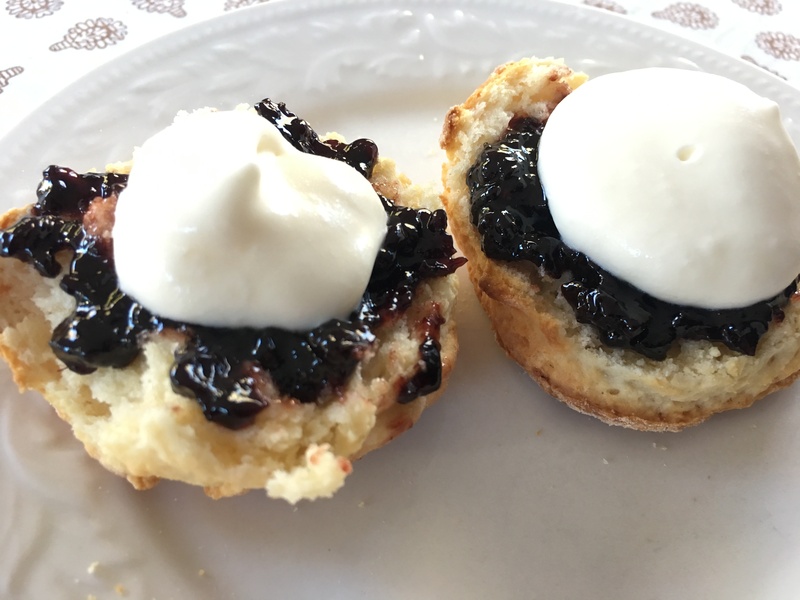 Scones with jam and dollop of cream, otherwise known as Devonshire tea, is a treat few can say no to. 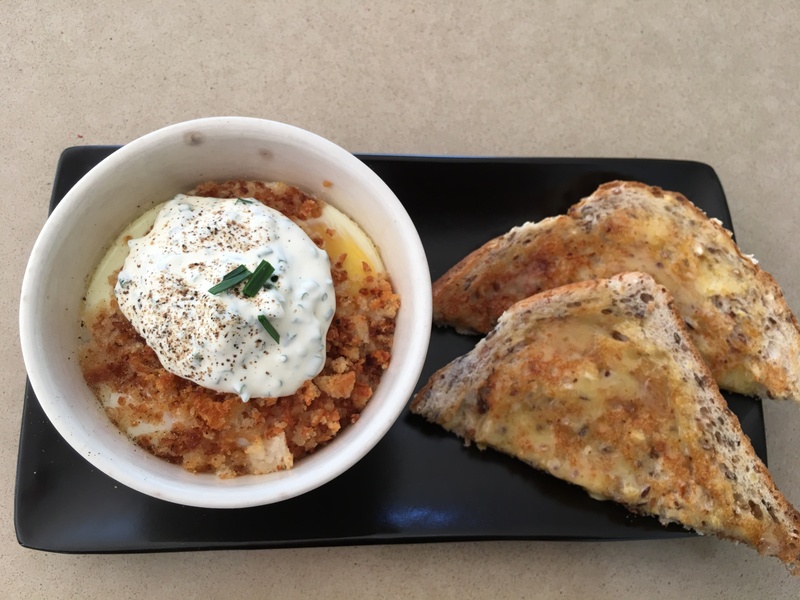 They are not difficult to make, but as with all easy recipes – scrambled eggs for example – a lot of people don’t get it right. The secret is to handle the dough as little as possible and get the scones into the oven quickly. It’s not bread dough and should not be kneaded: over-handling will make them tough. With practice you can make scones in just under half an hour – perfect for a last minute afternoon tea. Ring your friends, switch the oven on and as they walk in the door you’ll just be taking the scones out of the oven. 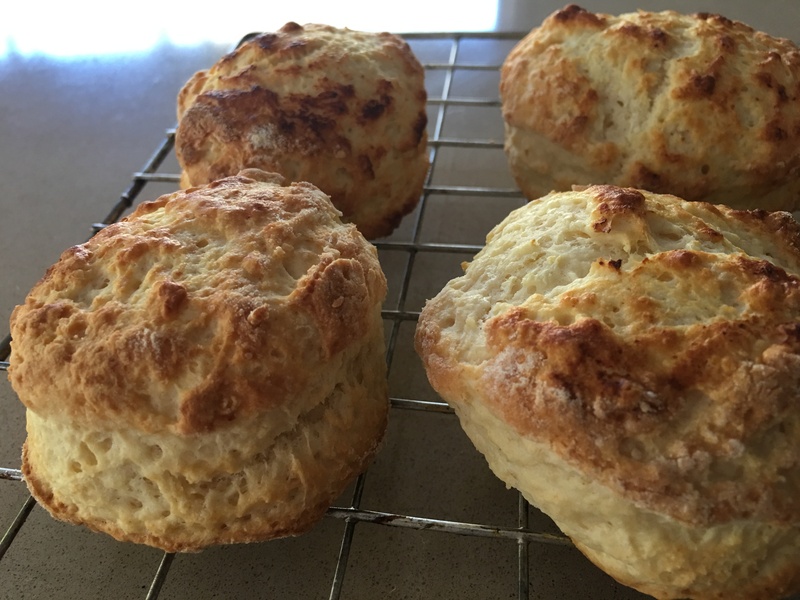 Sour milk or buttermilk works well in scones. They say it makes them rise more and I remember as a child if the milk went sour (which it seemed to do more regularly back then) scones were on the menu. You can also use fresh milk, buttermilk or a mixture of milk and plain yoghurt. Serve with any kind of berry jam – in the photo I used blackberry. The recipe is easy to double. Heat oven to 200°C. Sieve flour (and baking powder) into a bowl. Lightly rub in the butter with fingertips until there are no more lumps. Add sugar then milk, stirring with a knife, till it all comes together. It should all stick together, just, but don’t make it too wet. Tip onto a floured surface and form into a ball, then pat into a circle 2.5 to 3 cm thick. Cut scones with a round 2.5 to 3 cm cutter. Gather the scraps together and cut out 2-3 more from the remaining dough. Arrange on a greased shallow baking sheet. Brush tops with some extra milk. Bake for about 15 minutes until well-risen and lightly browned. Serve slightly warm with whipped cream and berry jam. You only need one or two zucchini plants in the veggie patch to be inundated in the middle of summer. And if you don’t catch them when they’re small, a day or two later you’ll find they’ve turned into huge marrows! Zucchini with Tarragon and Sour Cream is a good way to use up the big ones. 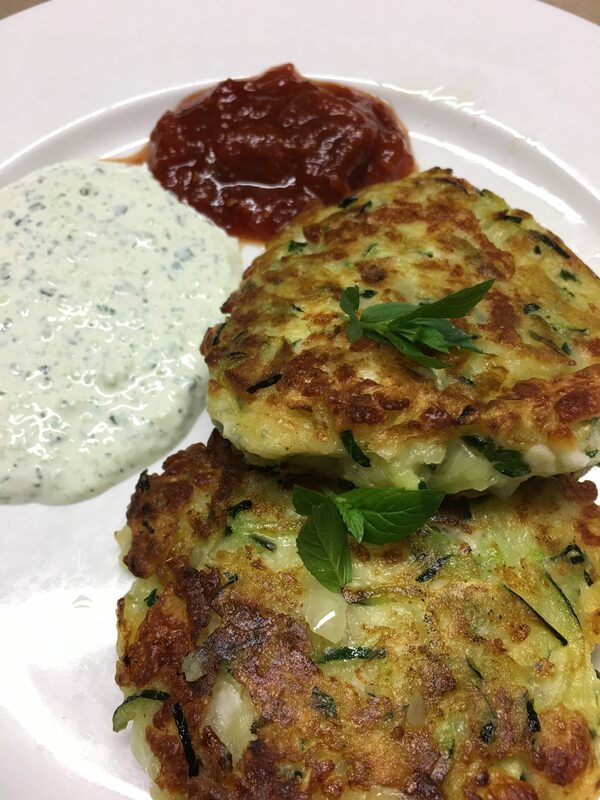 Zucchini and Haloumi Fritters make a tasty vegetarian meal and any leftovers are delicious cold or reheated in a moderate oven for 5-10 minutes. Serve with Tzatziki and/or tomato chutney. Use regular sized zucchini or remove the seeds from bigger ones. Coarsely grate zucchini and halloumi. If you have a coarse grating disk on your food processor, this is a breeze. Mix with remaining ingredients. Heat a little oil in a large frying pan and cook the fritters, 3-4 at a time. Use a tablespoon to dollop the mixture into the pan and flatten each fritter into a thick round shape. Fry for about 4 minutes each side, or until golden brown. Drain on paper towels and serve with the Tzatziki, mint leaves, salt flakes and a shake of ground cumin. A little Tomato Baharat Jam, or any other tomato chutney, also goes well. For the Tzatziki, place the grated cucumber in a sieve and sprinkle with a little salt. Leave to drain for a few minutes, then press down on the cucumber to squeeze out as much liquid as you can. Mix with remaining ingredients. Crème Caramel and Crème Brulée are my two favourite desserts. 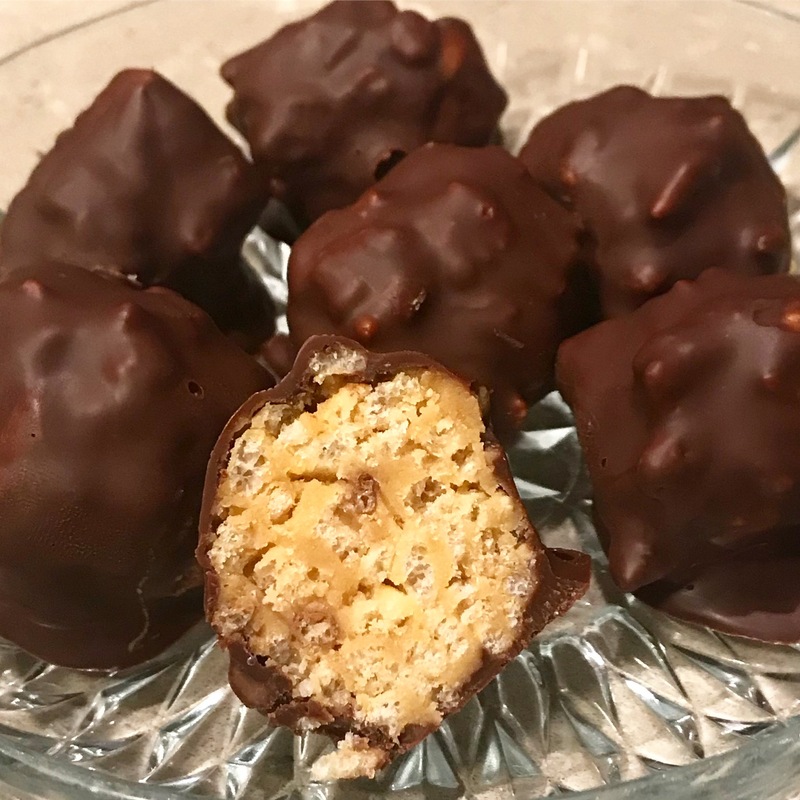 They’re quite similar in terms of ingredients, but one has a liquid caramel sauce while the other has a crunchy caramel topping, achieved with a blow torch. The raspberries you can see in the photo were ones I had frozen from our garden a couple of months ago. I took them out of the freezer about half an hour before serving, so they just had time to thaw, but not to go squashy. My Dad lived to the ripe old age of 90 and this was what he had for his last meal. I can see his face now, savouring every mouthful. I can’t think of anything I’d rather have for my Last Supper. Preheat oven to 170°C. Heat sugar and water in a heavy saucepan and stir until sugar has dissolved. Boil without stirring until you have a rich caramel, swirling the pan so that it colours evenly without burning. Tip into a lightly oiled ovenproof dish with a capacity of 1.5 to 2 litres (I used a metal ring mold) and swirl around so that it coats the sides of the dish as well as the bottom. Beat remaining ingredients together thoroughly with a balloon whisk, then pour through a sieve on top of the caramel, discarding any bits of egg in the sieve. Place the dish in a baking tin and add enough boiling water to come halfway up the sides. Bake for 50 minutes, remove and cool, then chill for several hours or overnight. 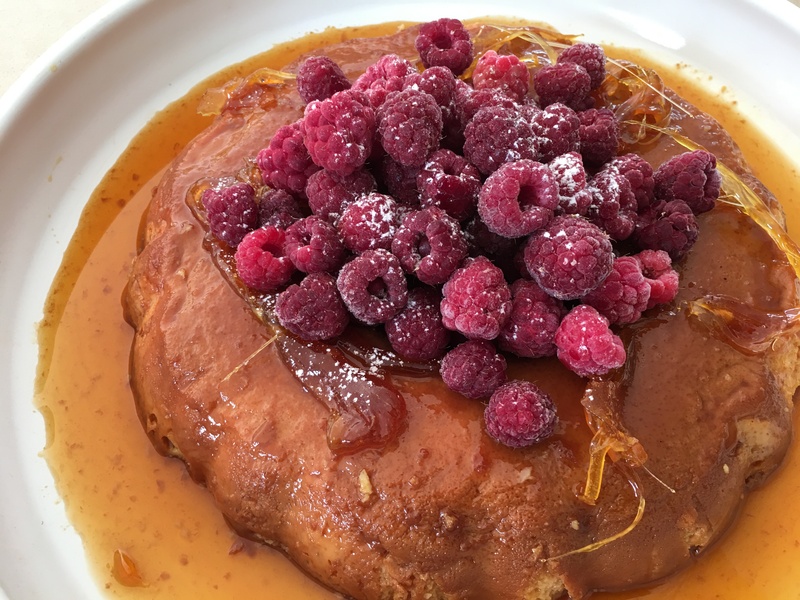 Loosen around the edges with a thin-bladed knife, then tip the Crème Caramel onto a serving plate. If all the caramel doesn’t come out, place the baking dish or tin in a bowl of very hot water to melt it, then pour it over the dessert. 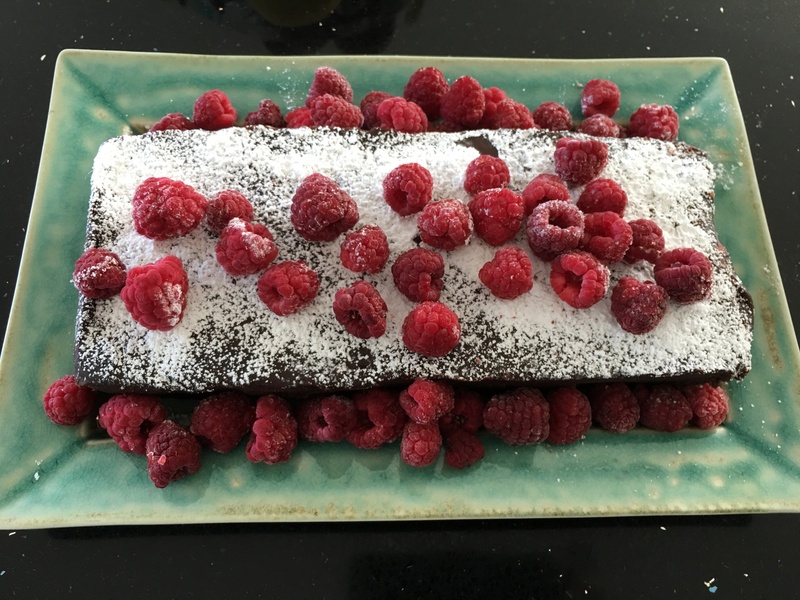 Serve with cream, fresh berries and a dusting of icing sugar.